The amount of spam bombarding the company inboxes was crippling. With such a vital communication tool under attack, it was critical for I.T. to contain the problem as soon as possible. The I.T. team were spending several hours per week filtering through a massive amount of spam daily. “After a long period of attempting to manage spam at the desktop and via basic MS Exchange filters, the volume increased to the point where we (IT) were constantly fielding complaints about both quantity and content” said Mr Stapley. Dealing with the high spam load was proving not only a nuisance but also a productivity drain and serious network security issue. HR issues were also becoming apparent as employees began receiving large amounts of pornographic and inappropriate material in their inboxes. We were previously using Exchange Intelligent Message Filter, which provided a much more basic and less granular filtering capability’ said Mike Stapley, I.T. Manager. A reliable and robust email security solution to replace MS Exchange filters had to be found. Huron Valley discovered SpamTitan after comprehensively researching several competitors on the Internet, as well as through trade publication reviews and at IT security tradeshows. SpamTitan was everything Huron Valley needed, it was both scalable and had extensive features including clustering, all at a fraction of competitor’s prices. In the first week, SpamTitan, with its double anti virus protection of Clam AV and Bitdefender, blocked several viruses from entering the network. As well as powerful spam and virus blocking Mr Stapley also appreciated the comprehensive and customizable reports. Huron Valley get an ongoing view of email usage on its network as well as a view of all spam and email virus hitting its mail servers. Some of the reports that Huron Valley use most frequently include overall system summary report, top spam recipients, and top viruses. According to Mr Stapley SpamTitan’s best feature is simply that it performs as promised with an immediate reduction in spam and time spent managing spam. SpamTitan has killed the spam and therefore the frequency of user complaints and spam-related queries to the IT department is practically non-existent, this now allows the department to focus on other areas. It was essential to get a solution in place in order to regain control of email quickly. Since implementing SpamTitan, Huron Valley Steel’s employees no longer have to filter through offensive emails and can focus on more importance activities. In terms of HR improvements, having SpamTitan in place demonstrates that the company is taking appropriate steps to keep inappropriate email out of employees inboxes. “The experience and service has been excellent, so much so, that on our renewal this year we opted for a 3 year license” concluded Mr Stapley. 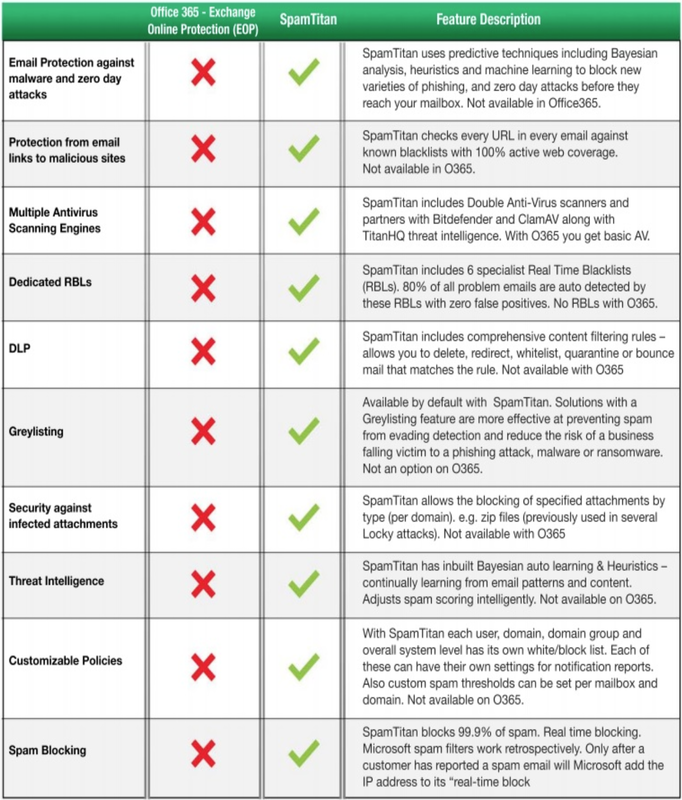 How Do Office365 and SpamTitan Compare? Microsoft Office 365 has been adopted by many organizations. While Office 365 does include email security controls, many organizations discover that significant quantities of spam and malicious emails are still delivered to inboxes. The solution is to adopt a defense in depth approach and layer a further email defense solution on top of Office 365. 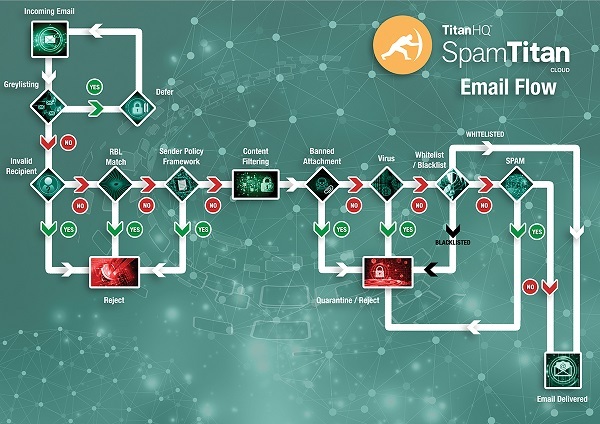 SpamTitan has been developed to compliment Office 365 and enhances protection against spam emails and malicious messages. In contrast to Office 365, SpamTitan uses a variety of predictive techniques to identify new threats. In-built Bayesian analysis, auto learning, and heuristics greatly enhance detection of spam emails and malicious messages. Further, SpamTitan constantly learns from email patterns and content and gets better over time. The email filter of SpamTitan uses SURBL filtering and malicious URL detection mechanisms to minimize the likelihood of a malicious email avoiding detection, while twin anti-virus software engines from Bitdefender and ClamAV ensure that 100% of known malware is blocked.